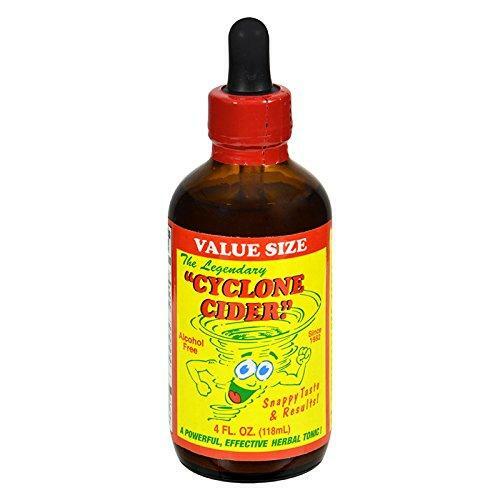 Cyclone Cider's power packed formula is a combination of 6 concentrated herbal extracts in a pure apple cider vinegar base. CAYENNE PEPPER -- High in vitamin C. Stimulating, astringent, promotes circulation. GARLIC -- "Nature's Antibiotic." Supports the immune system. ONION -- Garlic's buffer. Cleanses. Stimulates. HORSERADISH ROOT -- Stimulating. Cleansing. GINGER ROOT -- Benefits intestines and digestion. Stimulates. PARSLEY -- A natural diuretic. Starting to feel icky? Cyclone Cider is a strong preventive herbal tonic and cleanser. *Throat tonic for singers, public speakers, etc..
*Cleansing programs, fasting, "morning flush"
Two dropper full per dose: Take it straight and whenever you desire. Tip: Follow with a spoonful of honey to soothe a sore throat and sip down with a hot cup of lemon tea. ~Store in cupboard or refrigeration, shake well before use.